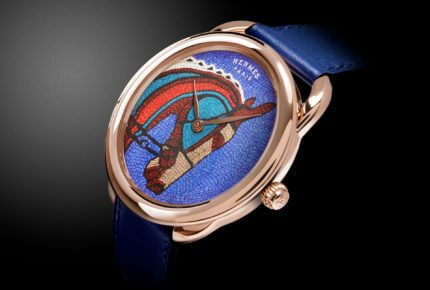 A 41mm Arceau watch in pink gold frames a horse’s head, borrowed from Hermès’ “Robe du Soir” silk scarf. The design is assembled from 2,200 tiny pieces of leather. A reminder of the company’s heritage as a saddle-maker, it is proposed as a limited edition of twelve numbered pieces. This new rose gold Arceau reaffirms its style in radiantly vibrant colours. 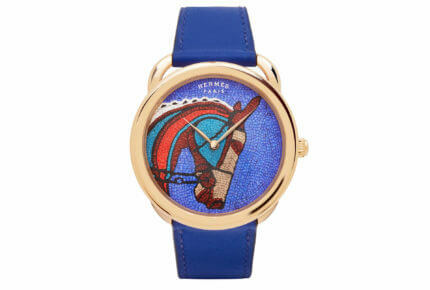 The horse with its vivid hues stands out beautifully against the electric blue background, enhanced by a Swift calfskin strap in the same shade. Designed by Henri d’Origny in 1978, the famous round case with its stirrup-inspired asymmetrical lugs lends its classicism to the unbridled originality of this model. Sweeping over the leather mosaic dial, the slender hours and minutes hands are driven by a self-winding Manufacture Hermès movement that can be admired through the sapphire crystal case-back. Issued in a 12-piece limited numbered edition, the Arceau “Robe du Soir” watch transposes the art of contemporary mosaic into the playfully creative world of Hermès.